Hey beauties!! Just wanted to quickly share the moisturizer I've been using daily for the past few weeks. The Lumene Vitamin C Drops are a unique serum made up of Arctic Cloudberry Seed Oil that is meant to moisturize, boost radiance and brighten your skin all in a little drop. If you're also looking for a sunscreen, these little drops moisturize AND protect the skin with SPF 15. Lately I've been seeing so many moisturizers come in these tiny capsules, which I'm on the fence about. I have a love/hate relationship with these little things, I've been weighing the pros and cons. Personally I like a regular skin cream in a bottle much better. I find that using the capsule just doesn't give me enough product. After I open the capsule every day I always want to open another one, because one capsule just isn't enough to cover my face and neck. But on the up side, after using the capsules for 28 days, (which is what one bottle will cover) I did see my face become brighter and smoother. Per the Lumene website, After 28 days, a consumer test showed*: •Smoother skin 98%* •Fine lines softened 92%* •More Radiant skin 85%* •Wrinkles reduced 74%* I can't say the above results were one I experienced, but my face glows a bit more and is a bit more, "Bright" Overall I thought these worked great as a moisturizer and a primer for your makeup. 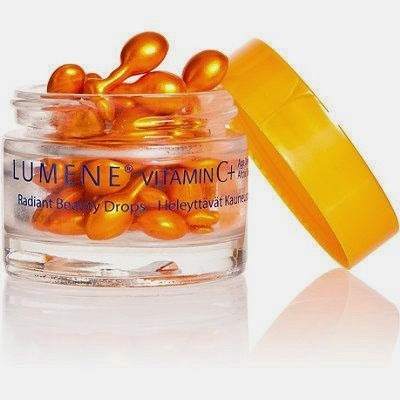 Lumene Vitamin C Drops are available at your local drugstore such as Walgreens for around $20. Wow, Vitamin C in capsule form is such a good idea, just because it expires really quickly otherwise (it starts as soon as you open the jar). I'll have to look into this! Love everything for the face with Vitamin C - it helps so much with skin radiance! You're glowing sweetie! What a great idea to throw these in ball form! I love Lumene products. I swear no one knows about them!